• Heart and vascular doctor's answering service. 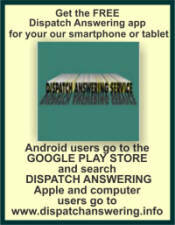 • HVAC answering services dispatching utilizing your in house software. Dispatch Answering Service special features provide many enhanced operations: Calls recorded for quality, online screening (on call personnel) and information on operator screens, retrieve messages online or smart phone, all calls faxed or send to any electronic device and HIPAA compliance. This Employee Safety Monitoring service provides a means of monitoring the safety of employees working either alone or in an unsupervised, remote or dangerous environment. Monitoring process is conducted 24/7 automatically and reliably with no human intervention. Employees that fail to respond to the check in schedule will immediately trigger an emergency alert to the supervisor. If the supervisor fails to respond, the call will be escalated to an hierarchy of chain of command, manager, administration, etc., until someone is notified. Services: Clinical Communications, Healthcare Messaging, Care Team Collaboration and any professional Company needing Secure & Encrypted Text Communication. Dispatch Answering has APT Ready to use with Integration-Friendly TigerText can be connected to your vital hospital systems like ADT, Labs, and Scheduling for seamless alertin g .